When I was a kid, my favorite board game was The Game of Life. I loved the fact that I could pick a career, buy a house, and choose how I would live my life through to retirement. And, because I was a kid, I also enjoyed spinning the wheel and driving my car down the roads, taking alternate paths depending on my choices. Electronic Arts has faithfully translated this experience to the iPad, showing once again that the platform is a perfect choice for family board games. Whether you’re playing by yourself, or passing the iPad around with you family, The Game of Life for iPad (and for iPhone) is almost exactly as you remember it. If you’re unfamiliar with The Game of Life, the concept is fairly simple. You begin by choosing a character and setting him or her off starting at high school graduation. Will you go to college, or dive right into the work force? Along the way, you’ll choose what type of job you’ll take, what sort of house you’ll live in, how many kids you’ll have, and so on. The final goal is to retire in comfort, and the player with the most money and valuable assets is the winner. 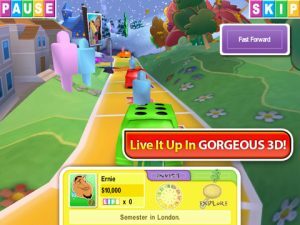 Throughout the game, players will receive various cards, allowing them to force opponents to pay for expenses, or giving them the option to choose more numbers when landing on the “Spin to Win” space. During Spin to Win, players choose a number and spin the wheel. If they land on that number, they win a massive jackpot. More money can be earned or lost by landing on “Pick a Card” spaces. Some cards reward the player for things like winning competitions, while others impose expenses like sending a child to college or having to repair your automobile. 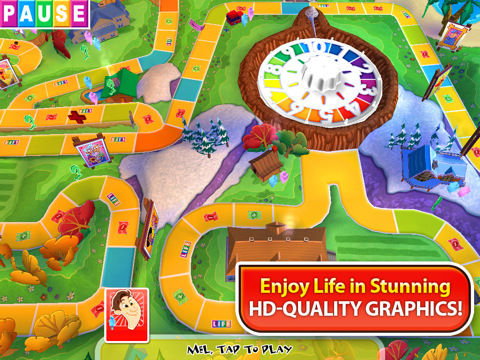 The iPad version of The Game of Life is very well done. Though the default view of the game is zoomed in a bit too far for my taste, you’re given the option of zooming the camera out to see the entire board or moving the screen around to explore certain areas. Spinning the wheel is just as satisfying as it was when I played as a child, but much of the rest of the game is quite automated. For example, some cards are played by the computer for the player, such as the “Exemption” card. These cards exempt the player from paying expenses for opponents. It would have been nice to have the option to hold onto this card in case it was needed later. The game adds nice bells and whistles to make jazz up the experience a bit compared to the board game. 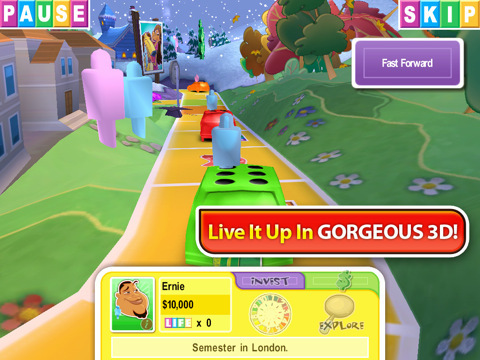 Subtle visual and sound effects are played during spins and when items are played. 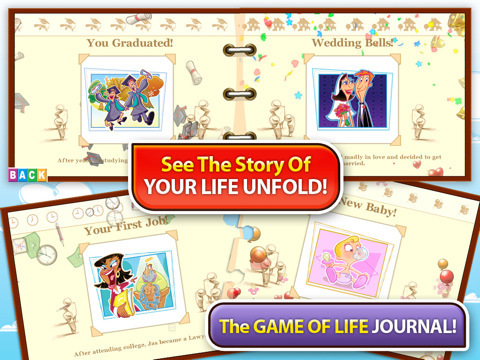 In addition, the winner of the game receives an amusing virtual scrapbook chronicling their entire “life”. 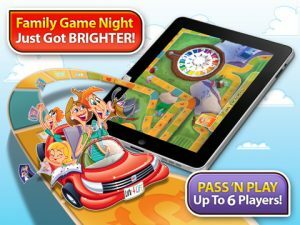 Bottom Line: The Game of Life for iPad is a great game for the family and does a nice job of translating the board game experience to the iPad. 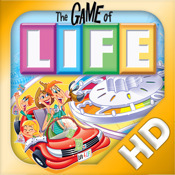 The Game of Life for iPad is compatible with iPad. Requires iOS 3.2 or later.